Wood flooring has made a comeback in the past few years and is once again the floor of choice for many builders. When we think of wood paneling, most think of Grandma's basement, or a rec room we played in as kids. While it is typically used as wall covering, it can be used with great effect on floors as well. With paneling you can do it quicker and cheaper with surprisingly good results. Luanne is typically a mahogany-grained plywood used for cabinet panels, soffits under the eaves of houses and the like. Laid on solid surfaces, such as concrete or wood floors, it can work well if provided with adequate finish. It comes in 1/4-inch thick sheets that make it light and easy to work with. Cabinet grade hardwood plywood is slightly more expensive than the plywood typically used for dog houses and similar structures. It comes in a variety of grains. Patterns, such as vertical grooves, can be cut into its surface to simulate wood board flooring, or install the plywood "as is" for a modern feel. Use panels with grooves and cut "dove tail" style notches into each end of the panel. Every other "board" is shortened with the next panel in line being cut opposite to fit into it. This gives the appearance of traditional board flooring. Cut hardwood plywood or luanne into large squares. Sixteen-inch squares fit three across and six down on a standard 4 x 8 foot sheet of plywood. Lay them with the grain running in opposite directions to create a checkerboard type "parquet" effect. Cut a roundover detail on the edge of large plywood panels and lay them full size for an open modern feel. Use wood-colored caulk to seal any gaps between panels and apply your finish after the floor is installed. Wood panels can be stained with oil- or water-based stains. Separate stain and finish is best for floors. Choose a stain that complements existing woodwork. Colored stains, such as red, green or blue, are even available that allow the grain to show through for a beautiful effect. Painted finishes can be used on wood floors. Distress paint finish with a sander and add clear varnish on top for a "shabby chic" look. Or go with a high gloss for modern elegance. Choose paints with an outdoor rating for best durability. Floor paints are the best. 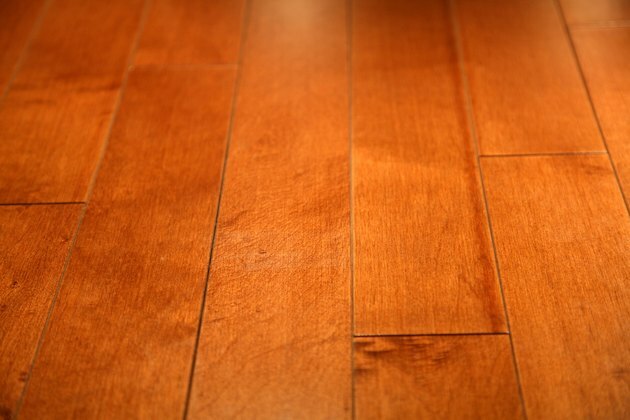 Clear polyurethane or floor wax can be applied over stain or paint or directly on unfinished wood for a natural look. Choose products recommended for floors because others can be slippery. In waxes, choose a wax with a high percentage of solids.